The TD Ameritrade Client Rewards Card provides prospective cardholders with an extremely simple way to earn points to spend on anything from airfare to brand-name merchandise and gift cards. The card features 1.5 points back for every dollar spent on qualifying purchases with the TD Ameritrade Client Rewards Card. Beyond that, cardholders are able to earn an extra 10,000 points -- a $100 value -- by spending at least $500 in net purchases during their first 90 days with the card. Even further, if a member has built up at least 2,500 points to their name, they can redeem those points directly to a TD Ameritrade account, resulting in a 10% increase in value – i.e. 8,000 points turn into 8,800 points, or from $80 to $88. Points earned have no expiration date and there’s no limit on what you can accrue, so cardholders can save up their points to be spent on travel needs, merchandise/gift cards for over 600 companies or as a statement credit. The APR for purchases with the TD Ameritrade Client Rewards Card will be 18.24%, 20.24% or 25.24% Variable depending on your creditworthiness, and there is no annual fee with the card. Balance transfers will receive a variable APR right off the bat of 15.24%, 20.24% or 25.24% Variable. Note that there is no intro APR for purchases or balance transfers with this card. No annual fee - The TD Ameritrade Client Rewards Card has absolutely no annual fee. 1.5% points on qualifying purchases - Cardholders will receive 1.5 points per dollar spent with their TD Ameritrade Client Rewards Card. $100 cash back – For a limited time, new members can earn 10,000 bonus points -- equal to $100 cash -- when they spend $500 during their first 90 days with the card. 10% bonus point value to a TD Ameritrade account - When cardholders redeem their total of at least 2,500 points as direct cash back to their TD Ameritrade account, those points will receive a 10% increase in value. For example, if you’re redeeming 5,000 points to your account, the 10% bonus will raise that to 5,500 points, bringing the real-life value from $50 to $55. Smart Tip - The TD Client Rewards card immediately becomes much more valuable if you have or open a TD Ameritrade account due to this benefit. Redeemable rewards - Cardholders can use their rewards for a variety of different types of purchases. Adding two zeros to a purchase amount determines how many points are needed to achieve that total. For example, 20,000 points would be equal to $200. Travel - Your points can be redeemed for every part of trip, including airfare, car rentals, hotel stays and more. These may be subject to availability restrictions. Gift cards and merchandise - Cardholders can visit TDBank.com/TDAClientRewards to purchase gift cards and merchandise from over 600 brand names that are partnered with TD. Pay toward your account balance - Points earned as a cardholder can be redeemed as a statement credit to help pay your account balance, though you are still required to make the minimum monthly payment. To make any sort of point redemption, including statement credits, cardholders need at least 2,500 points accumulated. No limit or expiration - TD allows cardholders to accumulate as many points as they can for however long they want so it can be used when they really need it. For your travels - The TD Ameritrade Client Rewards Card offers some standard Visa® travel benefits. Travel accident insurance - This policy covers the cardholder and any family members for injuries that cause accidental death or dismemberment when traveling either by air, or on water or ground. This also covers cardholders during their movement to and from the airport, as well as in between terminals during their travels. Travel emergency assistance - Cardholders can receive aid over the phone when in an emergency while on a trip. Visa® will help by calling local emergency services to take care of the cardholder and their family. Auto rental collision damage waiver - This covers any rented vehicles of the cardholder in the event that it is stolen or damaged. This claim must be reported to Visa®, as it will act as the liaison between the rental company and the cardholder. For this to apply, the entire rental bill must’ve been paid using the TD Ameritrade Client Rewards Card. Roadside dispatch - This is a $59.95, pay-per-use service that helps cardholders with 24/7 roadside issues like tire changes, tows and fuel delivery. The price includes a tow of up to five miles or a lockout service. TD Visa Signature benefits - Visa® Signature members receive extra perks to keep their mind at ease while on a trip. Free phone concierge - This is a phone service available 24/7 that helps TD Ameritrade Client Card holders research their destinations, including buying tickets to events or shows, or aiding them in finding things to do while there. Luxury Hotel Collection - TD Ameritrade Client Rewards Card holders are automatically a part of this hotel discount program. This offers Signature® members price reductions for where they stay, as well as at restaurants, when shopping and for rental rides. Visa® Zero Liability - Cardholders are completely protected from any unauthorized use of or access to their TD Ameritrade Client Card. If an issue arises involving this, members can call the 24/7 Credit Card Customer Support line at 1-888-561-8861. 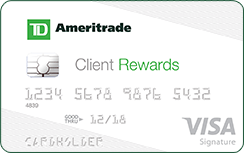 The simplistic, but beneficial nature of the TD Ameritrade Client Rewards Card makes it great for those who want to add some rewards to their daily credit card usage. Because there’s no rotating categories and instead a flat 1.5% point rate across transactions, there’s absolutely no hoops to jump through to make sure you’re getting the full benefit afforded to your card. But to really maximize the rewards earned with this card, the cardholder needs to have a TD Ameritrade account, as anyone who does will automatically receive a 10% point value bonus for depositing that cash back directly into the account. For example, that would bump up a cardholder planning to use 12,000 points to transfer to their TD Ameritrade account to go from that total to 13,200 points. More practically though, that would raise the cash back deposit amount by $12 from $120 to $132. Points earned with the TD Ameritrade Client Rewards Card will appear in the cardholder’s account at the end of each billing cycle. Purchases that have been returned, credited or when adjustments have been made will affect your point total depending on how much is taken from the total purchase amount. The only exception to this rule is with the 10,000 points -- or $100 in cash value -- up for grabs by making $500 in net purchases during the first 90 days with the TD Ameritrade Client Rewards Card. That point total will post to the cardholder’s account roughly six to eight weeks after the above threshold is hit. If your TD Ameritrade Client Rewards Card account falls out of good standing, then any unused points earned during the life of your account could be lost. Some reasons for this could include situations of bankruptcy, a “serious delinquency” in making monthly payments or misuse/fraudulent use of the account. Also, if the account is closed for any other reason, either by TD itself or by the cardholder, then those unused points need to be claimed no later than 60 days after the account closure before they too are lost. Any returns or credits sent back to your TD account will reduce the amount of points received for that purchase by whatever total is returned back. The total lack of a 0% introductory APR on both balance transfers and purchases could be a major turn-off for some. Points are earned with the TD Ameritrade Client Rewards Card at a flat 1.5 points per dollar spent rate. Bonuses can be earned two other ways -- either by spending $500 during your first 90 days with the card, or by redeeming your point value directly to a TD Ameritrade account. If you hit that $500 mark during your first 90 days as a cardholder, you’ll receive a 10,000 point bonus -- equal to $100. As for the second bonus option, if you redeem any point value directly to your TD Ameritrade account, you’ll receive a 10% bonus value on top of that. The APR for balance transfers will be 15.24%, 20.24% or 25.24% Variable, depending on your creditworthiness. The lack of a 0% intro APR on balance transfers means this is not an ideal card for those planning to make balance transfers. 15.24%, 20.24% or 25.24% Variable, based on your creditworthiness. This APR will vary with the U.S. Prime Rate. 27.49% Variable APR -This APR will vary with the U.S. Prime Rate. Balance Transfer Either $5 or 3% of the amount of each transfer, whichever is greater. Cash Advance Either $10 or 5% of the amount of each cash advance, whichever is greater. Those looking to become a TD Ameritrade Client Rewards Card holder are probably enticed by the upfront nature of the 1.5% back in rewards points and the lack of a need to keep an eye on any rotating categories. So while some other similar cards on the market may have a few extra steps in the rewards process, the potential for a larger point pull is there -- take the Citi® Double Cash Card for example. Citi® Double Cash Card members will receive 1% cash back upfront after a purchase is made -- a rate lower than the TD card has. But once the cardholder makes a payment on their monthly statement, they’ll get back another 1% cash back as long as they pay the minimum due on the bill. So the 2% back that the cardholder will eventually receive does technically surpass the TD card, although the TD card does offer more points back immediately. The sacrifice for that eventual 2% cash back is that the Citi® Double Cash Card does feature a higher ongoing balance transfer APR range at 15.49% to 25.49% variable compared to that 15.24%, 20.24% or 25.24% Variable on the TD Ameritrade Card. However, the Citi card does include a 0% introductory APR for 18 months on balance transfers making it an infinitely more attractive choice for those looking to move around credit card debt of any kind. The TD Ameritrade Client Rewards Card is an uncomplicated rewards card in a world filled to the brim with rotating rewards categories and complex redeeming options. The 1.5 points earned per dollar spent with this card on any purchase make it so users can maximize their rewards daily without having to think about where they need to spend their money. If you own or are looking to get a TD Ameritrade brokerage account, this card becomes especially worth it for you, due to the 10% bonus value on points when redeeming directly to a TD brokerage account.